When the public library in Hudson, NY, moved from a century-old almshouse into a newly renovated armory a block away in 2016, it became the place to go. Locals who had never visited the library before started hanging out there—including middle schoolers, who made themselves comfortable in common area chairs during the late afternoon. Shanekia McIntosh saw an opportunity. A writer and curator of art exhibitions around Hudson, McIntosh thought the Hudson Area Library’s (HAL) armory space was a perfect place to bring together tween-agers and local artists. In the summer of 2016, HAL held its first Hack the Library program—a weekend of free labs where kids learned from experts how to use digital technology to create works in sound, video, and images. McIntosh was hired as the full-time youth programmer, and Hack the Library has since grown into a twice-a-year event. While many librarians who started in adult or children’s services are directing more attention toward tweens, those like McIntosh who are comfortable with the latest digital tech are especially well suited for a generation raised on iPads and smartphones. They’re using technology to spark kids’ interest in the arts, literacy, and more. 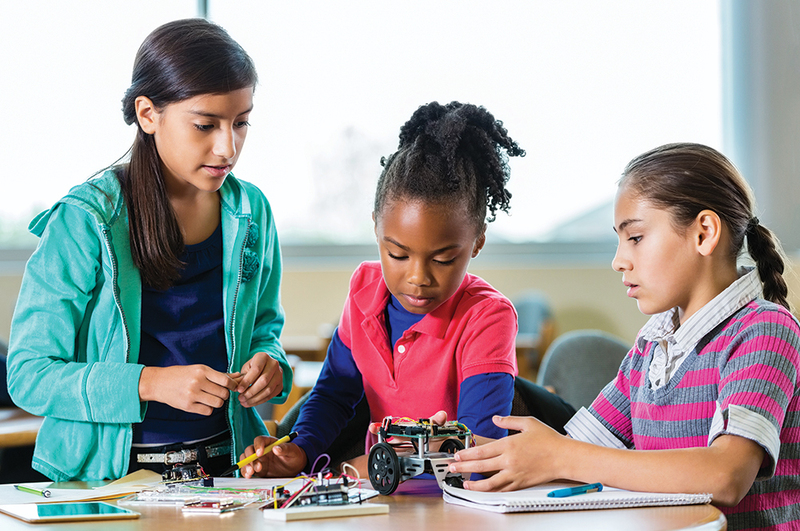 At libraries, tweens can experiment with tech without the pressure of grades and still develop important habits of collaboration and discovery—all while having fun. McIntosh regularly meets with a tween council, eight kids between the ages of eight and 12. What they want, McIntosh says, are opportunities to try out various art mediums in a “judgment-free” zone, where they aren’t made to feel awkward if they don’t understand. Recent immigrants—Yemeni, Salvadoran, Bangladeshi—are among the group, and not all have smart devices at home. One team wants to program the micro:bit to spell out a word tapped into it by Morse code. “I don’t think they know how ambitious that is, but I’m going to let them just go,” Matteson says. Students have made sound collages by recording noises around the library on smartphones—shuffling feet, creaking doors—and editing these bits together into a seamless whole. They’ve made short films with local videographers Theo Anthony and Zia Anger that started with research in the library’s history room and walks about Hudson, and culminated in short, idiosyncratic films, from historical reenactments to science fiction dramas. A September program, Digital Dancing, combined dance and augmented reality. Over three days, tweens rehearsed with choreographer Adam Weinert to create a performance that was shot from multiple angles—by kids—on smartphones. Later, library visitors could use their phones to scan a QR code at various spots where the dance took place and relive the performance. While the programs range widely, they’re all replicable, says McIntosh. All make use of free or inexpensive tech—library-owned smartphones and open software: Audacity for recording and editing sound, and DaVinci and iMovie (not open, but readily available) for video. The idea is that the kids can continue to use the skills they acquire. The tweens also do their own promotion, making flyers and spreading the word at school. Short, intense programs work the best for tweens, McIntosh adds—and it’s how they want to learn. Tweens at Lancaster University (UK), where professor Sally Bushell designed the Litcraft game, based on classic novels. Sally Bushell, a literature professor at Lancaster University, UK, is betting that tech can spark a love of reading among teens. 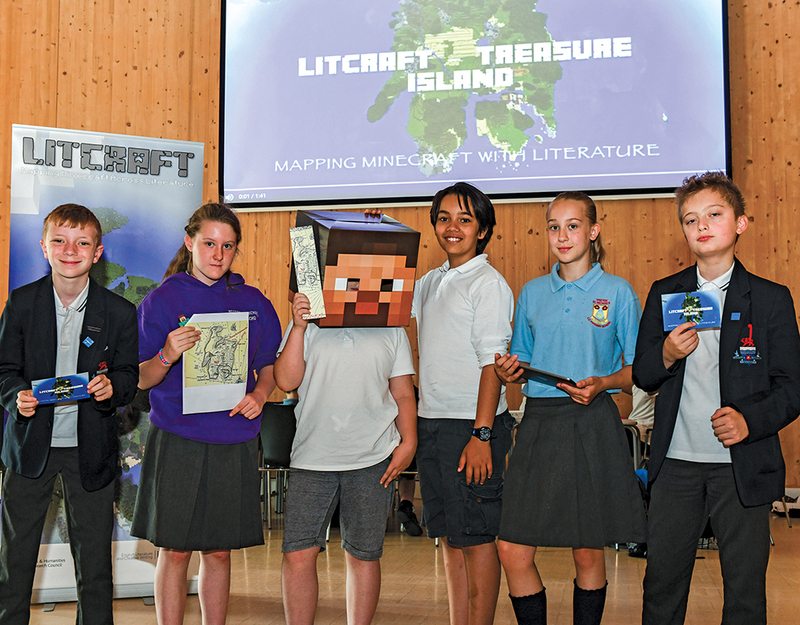 Bushell is the designer of Litcraft, an immersive game built on the Minecraft platform, in which players use a classic novel as a kind of map for navigating the tale’s virtual world. Students read a section of the novel, then enter the Minecraft-like world where they encounter various tasks, from solving problems raised in the novel’s plot to writing. The prototype Bushell has tested out with teachers and librarians is based on Robert Louis Stevenson’s Treasure Island. Players assume the role of the protagonist, Jim, hopping ashore on Skeleton Island, discovering treasure chests, and searching for clues, while following the novel’s plot as a guide through the digital landscape. A series of writing tasks gives players an opportunity to reflect on the novel’s meaning much in the way a real Jim might think about his own experience, Bushell says. Litcraft’s target audience is kids 10 to 12, though Bushell wants to a create a version based on Lord of the Flies for high school students. Her gamification entails mapping out weeks of assignments and activities on traditional game boards or on a gaming platform, such as Classcraft, so that students can complete work at their own pace and through any number of paths, or “quests,” picking up points they can cash in for rewards, from actual food to previewing an upcoming exam. In effect, students proceed through class units, about a month’s work, the way they would find their way across Skeleton Island in Litcraft, by choosing the order in which to complete assigned tasks. While everyone in the class arrives at the same destination, individual journeys take the shape most conducive to a student’s learning. Brian Seto McGrath is an editor of TIME for Kids magazine. It was fantastic to learn about all of these ways librarians and teachers are adapting games and learning to make it more conducive to their audience. My coworker just mentioned Breakout Edu, a service that creates escape rooms that can be tailored to different subjects. That seemed useful to mention here as well!